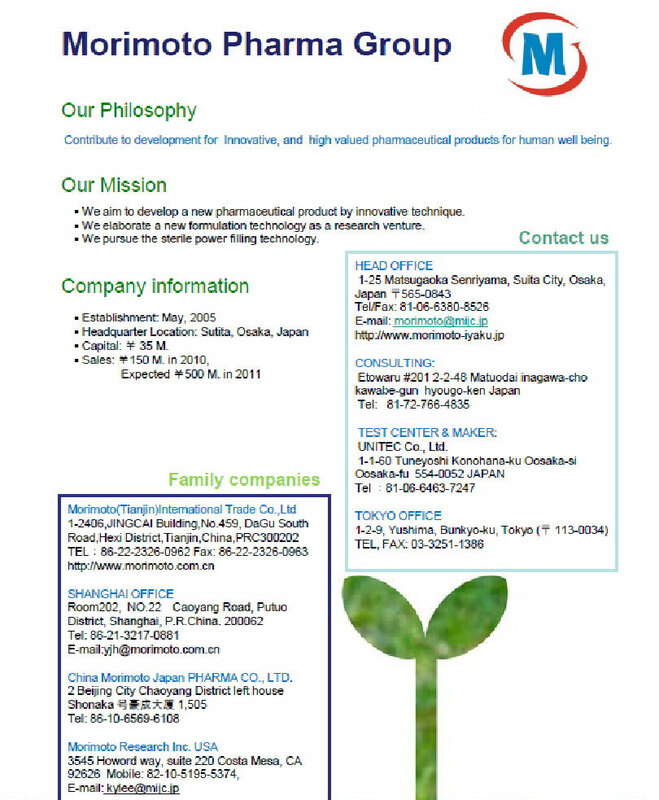 Morimoto-Pharma Group(MPG) was founded in 2005 by Shuji Morimoto who was the research manager of Takeda Co. Ltd, which is the top pharmaceutical company in Japan, and the plant manager of Tianjin Takeda Co. Ltd. in China. The president Morimoto and his team have strong experiences on the new technology, such as TTS and DDS, and the technology transfer of external use medicine from Japan to China. And he has more than 70 patents, including the technology for the formulation of cataplasms, the design and preparation of micro-sterile powder filling machine, tablet transfer system, high efficiency float granulating Coating machine, package and medical device, etc. Morimoto-Pharma Group(MPG) is specialized in the research and development of new dosage forms especially for oral medication with the strength of high quality and advanced technology for manufacturing the new products. MPG also covers the pharmaceutical field in the area of clinical trial, international trading, and Licensing business through Japan, China, Korean and USA with the subsidiary companies. MPG aims to contribute to the developing and manufacturing of high valued medicinal products for human well being. WHAT DO WE DO? WHICH ARE OUR MAIN RESEARCH LINES? Our activities are independently conducted by each subsidiary company. Manufacturing and selling M-Auger which is a Micro sterile powder filling machine, and Tab Screw which is the inline Screw Type of Tablet Transportation System changing your manufacturing line and plant with easy breakable objects like tablets, and could be very gently transported upwardly, downwardly and horizontally. Consultation on formulation design and scale-up process. Trade of medical related material and machine. License, Business between 4 countries and R&D of new dosage form. Representative of China CRO and Korea CRO. R & D of New Dosage Form and apply for drug company. (Tianjin) Morimoto (Tianjin) International Trade Co., Ltd.
Trade of raw materials, machine, packaging materials. Consulting service on Chinese current pharmaceuticals situation, including the policy, marketing investigation. Technical support for installation of equipment and technical transfer. (Beijing) China Morimoto Japan Pharma Co., Ltd.
IND and DNA application to SFDA..
Support on Audit on the clinical trial in China, and also as an acting Auditor. Consultation on R&D in China, including the investigation on Medical organization and etc. Consultation on marketing and promotion for those Japanese pharmaceuticals which are aimed to enter into Chinese market. China Morimoto Japan PHARMA CO., LTD.